Make yourself at home in one of the 137 air-conditioned rooms featuring refrigerators and flat-screen televisions. Your pillowtop bed comes with premium bedding. Complimentary wired and wireless Internet access keeps you connected, and satellite programming provides entertainment. Private bathrooms with shower/tub combinations feature deep soaking bathtubs and rainfall showerheads. The BEST WESTERN Hotel Pracharna is located in a close proximity of Olomouc, in the heart of Moravia. Our hotel provides a high standard of accommodation, gastronomy and congress services. We offer the widest range of services under one roof: Accommodations, conference facilities and professional services, a restaurant, bar and summer terrace, a Sauna and space for parking. Are you looking for suitable accommodations for your business partners, a private lounge for a private meeting or need a congress place to hold a conference? And what about a romantic place for a wedding? Then the BEST WESTERN Hotel Pracharna is the right choice for you! Make yourself at home in one of the 90 air-conditioned rooms featuring LCD televisions. Wireless Internet access (surcharge) keeps you connected, and satellite programming is available for your entertainment. Private bathrooms with bathtubs or showers feature complimentary toiletries and hair dryers. Conveniences include phones, as well as desks and electric kettles. This hotel is situated in a quiet part of the town of Olomouc next to the city parks where the Flora Olomouc flower show is held, just 200 m from the nearest links to the public transport network (tram). It is only a 10-minute walk from the UNESCO-listed historical city centre with its restaurants, bars and nightspots. The railway station and shops are 2 km from the hotel and the bus station is 3 km. Attractions in the surrounding area include Svatý Kope?ek Zoo (10 km), the Javorecko caves (35 km) and Krom? ?í (45 minutes' drive). Brno Airport is 80 km and Vienna Airport is 130 km. Renovated in 2009, this is a modern 10-storey city spa hotel with 165 rooms, including 3 suites and 1 studio. 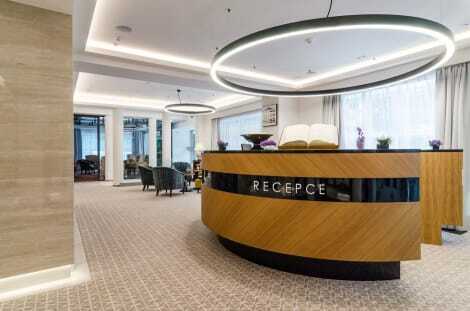 Facilities on offer to guests at this air-conditioned establishment include a lobby area with a 24-hour reception and check-out service, a hotel safe, a currency exchange facility, a cloakroom, lift access and a hairdressing salon. There is a bar and a restaurant and business travellers will appreciate the conference facilities including nearly 1,000 m² designed for congresses, meetings in sections, seminars, trainings, company and family celebrations, receptions and other social events. WLAN Internet access is available throughout the hotel and guests can also take advantage of the room and laundry services (both for an additional fee). A car park and covered garage parking are available for those arriving by car (charges apply to both). All rooms are appointed with standard furnishings and come with a private bathroom with a shower and a WC. They offer a double bed and are equipped with a telephone, satellite TV, Internet access and a minibar. Furthermore, centrally regulated heating and an ironing set are provided in all accommodation as standard. 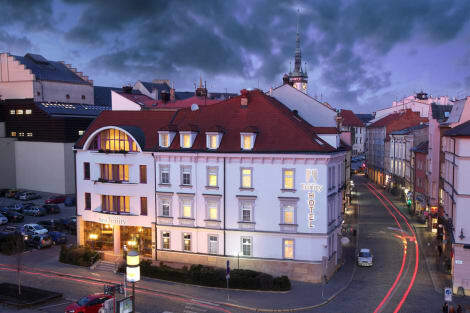 This 4 star hotel is located within the city of Olomouc and was established in 1998. It is a short drive away from the City Centre and the nearest station is Main Train Station. Make yourself at home in one of the 32 air-conditioned rooms featuring flat-screen televisions. Complimentary wireless Internet access keeps you connected, and cable programming is available for your entertainment. Bathrooms have complimentary toiletries and hair dryers. Conveniences include safes and desks, and housekeeping is provided daily. Make yourself at home in one of the 30 air-conditioned rooms featuring minibars and DVD players. Flat-screen televisions with satellite programming provide entertainment, while complimentary wireless Internet access keeps you connected. Private bathrooms with bathtubs or showers feature complimentary toiletries and hair dryers. Conveniences include phones, as well as safes and desks. Make yourself at home in one of the 33 guestrooms featuring minibars and flat-screen televisions. Complimentary wireless Internet access keeps you connected, and digital programming is available for your entertainment. Private bathrooms with bathtubs or showers feature complimentary toiletries and hair dryers. Conveniences include laptop-compatible safes and desks, and housekeeping is provided daily. lastminute.com has a fantastic range of hotels in Olomouc, with everything from cheap hotels to luxurious five star accommodation available. We like to live up to our last minute name so remember you can book any one of our excellent Olomouc hotels up until midnight and stay the same night.